Have you heard of intuitive eating? Intuitive eating is listening to your body — like children do — instead of following external rules. We are born intuitive eaters, but lose the ability with rules that we pick up from places such as magazines, social media, or television. Intuitive eating is listening to your hunger and fullness queues, and learning about yourself and your body. Children are naturally intuitive eaters and will continue to be if we give them the space to eat when and what they want — with limits, of course. 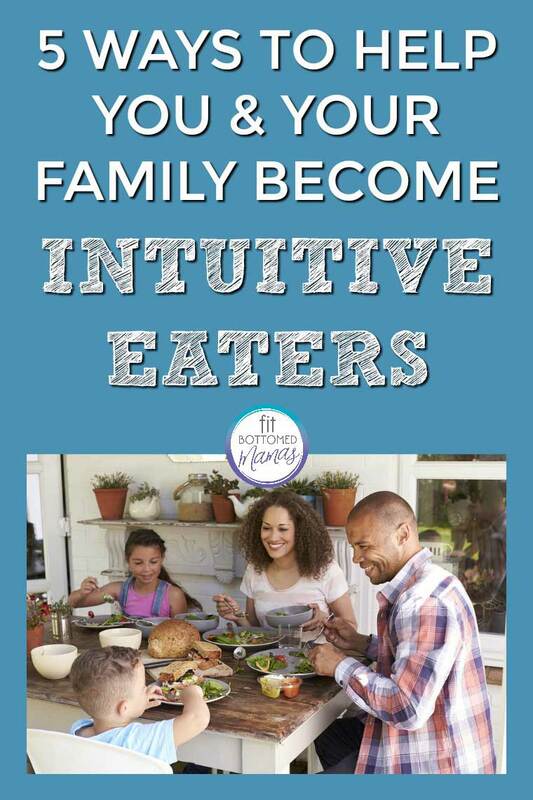 I encourage you to get your family in on intuitive eating — continue supporting your children with their own intuition — in order to succeed together. Take some pointers from your children who already have a stable relationship with food, and keep in mind that intuitive eating is not another set of rules, it is learning about yourself and respecting your body. 1. Reject the dieting mentality. You do not have to lose weight to be healthy. Make a list of negative dieting rules that are firmly instilled in you. Having them written down will help you be more aware of them when you allow them to control you or your children. 3. Find satisfaction in your food. Make eating a good experience. If you are at work, find a place other than your desk to eat. Taking your meal outside will help create a positive environment. If you are at home, making time once a week to take your food to your backyard or a park for a picnic is a great way to begin making an exciting food routine for your family to look forward to. If it is too cold to take your food outside, switch up your environment and take your meal to another room. How about the living room floor? 4. Feel good with exercise. Do not make exercise a punishment. Find a way to move that you enjoy; this will help inspire you to eat better and take pleasure from your food. 5. Make peace with food. Give yourself permission to have all foods including foods that you prohibit yourself. Once you remove the label of “restricted” from things such as chocolate — for me it is Hot Cheetos — they will stop having the negative power over you. As with any other method, intuitive eating is not easy and it takes daily practice. When first learning about intuitive eating, one of the first pieces of advice that stuck with me was the suggested attitude of curiosity. Like our children, we need to relearn how to ask questions before judging or shaming ourselves. If we can do this for ourselves, we will feel better and provide a healthy example for our children to continue growing and trusting their intuition. I am a big fan of intuitive eating. The hardest part for me is probably number five. It can be difficult when family members and friends feel like I am feeding my kids completely wrong and I should be making them eat their vegetables. Especially since feeding your children is one of the big jobs as a Mother. I suppose I need to gain more confidence and just know that it is what we feel is the right way to feed our children for a long term healthy relationship with food. @Simmons – thank you for sharing your thoughts! I am new to intuitive eating, and I wish I had known about it sooner. It simply makes sense for my family’s lifestyle. Number 5 is challenging for me too! It’s easy to judge someone with only watching what they are feeding their kids in a small period of time. You are not alone in needing to gain more confidence , we can do it knowing that we need to do it together. It takes a village. We ARE a strong village.